With all the hoopla of Valentines Day behind us I think it's time to consider that it's not only romantic love, but all kinds of love that we find a place in our heart for. I read this beautiful quote the other day and it just spoke to something within me. There are so many dimensions to the people, places and things that we love and I think this quote goes a little way to explaining why they are special to us. There are people we meet who resonate with us. You can spend years thinking you are friends with someone, and then one day it dawns on you that there isn't any real connection - that resonance of like mindedness has either never been there in the first place, or has gotten lost along the way. The friends who are special to us may have been in our lives for a short time or for many, many years, but they share that aspect of heart-felt connection and they contribute to who we are and who we are becoming. Long term love is another transformation. It's nice to think that the person we have chosen to spend our life with has the power to bring about positive growth and change as we walk life's paths together. If we're not growing together into better people then we need to look at our relationship and see what we can do to improve that resonance and help each other to become our very best selves. I think there is also a resonance that goes with places we love. It can be an instant recognition and love of somewhere new. We can arrive at a little town or a big city and just feel that sense of place - that feeling that you could live there if the opportunity presented itself. Then there's the places that we have grown to love, places that hold memories and where we have put down roots. It's nice to think that we are connected to the place where we live and that we are contributing part of ourselves to the community we live in - becoming part of the life force that makes our home town that little bit more special. Knowing that if we left we would miss it and be missed. 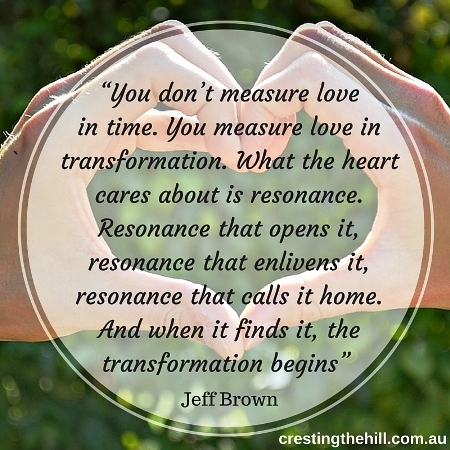 So, when I measure love (if it can be measured) I'll remember to look for resonance and transformation. To look for relationships and places that grow me and move me forward, that help me be the best person I am capable of being. As I grow older I am seeking resonance more and more. I appreciate the way you talked of love for places too. thanks Corinne - I think we want more depth as we get older - the frills are nice but we want substance too. I like the idea of positivity attracting more of the same Kathy - you certainly put yourself in the position to attract happier things if you are in the right frame of mind. I agree with Corinne there are places that can bring on those same feelings as if I were meeting an old friend. San Francisco, Seattle do that for me although I live in the Southeast of the U.S. I have special places too Rena - where you just feel like a little bit of your heart has stayed there and you find it again whenever you visit. I love your focus on resonance. I think about that as I write and make decisions about where to put my trust and energy. I love how you describe a friendship that has resonance. . . ."they share that aspect of heart-felt connection and they contribute to who we are and who we are becoming." That's so insightful and a wonderful measure to use. I think we get better at finding that resonance with others as we get older Julie - we're not interested in the superficial connections - we want something that is deeper and more abiding. I love your bottom quote! I think finding that resonance on a daily basis with our families is so important! I think I'll get off the computer and do something special for someone before they get home! I'm glad I inspired you Kathryn - I find the same thing when I'm focused on my screen instead of those around me - it's good to walk away and invest in the people you love. A beautiful quote and certainly much more substantial than the chocloates and roses of Valentine's Day. It makes me think of you and my blogging friends. We have never met and the likelihood that we will meet in person is pretty small and yet, here we are every day visiting each other and exchanging ideas. All these ideas serve to help transform us and hopefully make us better people. I certainly feel that way since joining the blogging community. I've let go of the bitterness in my life, all those external forces that I can't change because of the gov't etc. And now I choose to focus on positive things. This has been a direct result of my new purpose and friendships in the blogsphere. thanks so much CoCo - it's so easy to overlook the most valuable people and places in our lives, we need to remember to let them know how important they are to us. What a great post, Leanne! You are very on target! I love the quote you found and featured. It relates a bit to my post last week where I wrote about hesed love (the Hebrew word for sacrificial love, love with no exit strategy). Great to discover you on the Linkup at Coffee Shop Conversations. Thanks Pam - I'll have to pop over and read your post - love with no exit strategy sounds challenging! Leanne, I totally love this post. I love the perspective on love...transformation and resonance. I had never thought about it like this, but the concept was immediately recognizable to me as one of those, "Now, why didn't I ever think of that?" moments. I agree that resonance can dissipate, at which point it is time to accept that the relationship with that person, thing, habit comes to an end or is revived somehow. Thank you for sharing this! my pleasure Regina - I love how you can see that something can be revived as well as ended. It's so important to look at the whole picture and see where we can go with the relationship. It's amazing how things change, sometimes the people and places we are most attached to are not ours to keep. I'm not good with change or letting go, so I mourn these for a long time, I remember the good times and miss them too. It's hard for me to move forward sometimes and not miss the past. It's human, but it's so hard. I wish we knew when relationships started that they had a timeline. LOL Good luck in the future finding a love that fills you and grows with you! It's funny how certain people and certain places can fill such a hole in your heart and perhaps you don't see them/go there as often as you should. But they still give you that warm and fuzzy feeling. I love that feeling. what would I change if I could? have you noticed that life isn't always pretty? just curious ~ what makes us happy?